As a sole trader and owner director of a company I have been to lots of networking events and groups. I found that I couldn’t find one that didn’t involve paying out quite a bit of money, meeting more often than I felt I needed to (or it clashed with clients and they come first! ), I felt pressured to make referrals when they weren’t relevant, it was too exclusive (only women or only certain types of businesses which in fairness have their place), it didn’t feel relaxed enough to be able to comfortably chat or it was too far away. Did I talk too much or not enough? Do they think I am an idiot? Do I fit with this group of people? Will anyone want to collaborate and work with me on some projects? I couldn’t find a Bingley, Business Social so I though I shall create one. It is exactly that, a social in Bingley, for businesses once a month. It costs – nothing! All I do is arrange the dates and times and all you have to do is turn up and network. If this evolves into something more then that is fantastic! 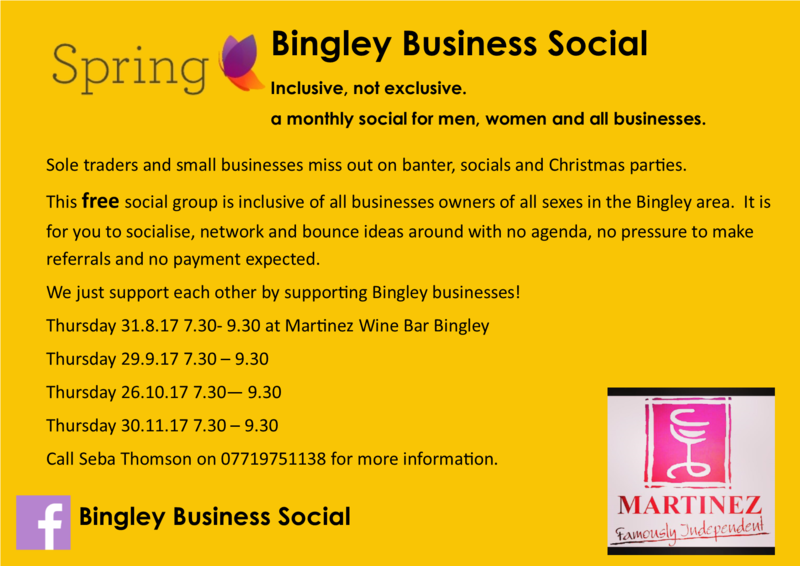 I am very excited to launch the first Bingley Business Social on Thursday, 31st August 2017 at Martinez Wine Bar. I do look forward to meeting many more Businesses from Bingley! 2 Responses to What is Bingley Business Social?